This shouldn’t be too difficult and will cover off layer 2 and layer 3 creation. I’m attempting to build the lab seen in the introduction post so that’ll be 10 Layer 2 + 3 VLANs on Rip-3560-1 to begin with. 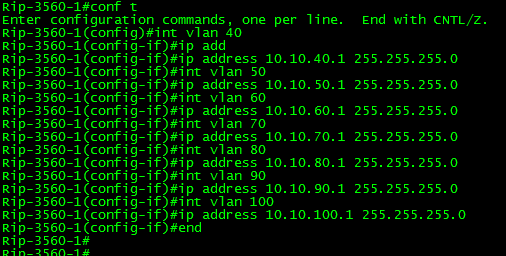 It is easy to jump to each now VLAN within config-vlan line mode as per above. Once you’ve finished do a sh vlan to verify. In order to facilitate full IP comms we’ll also need to configure the layer 3 interfaces outlined in the IP Table. Rip-3560-1 will be the L3 gateway for all of them for now. You’ll need a layer 3 capable switch at this point or you’ll only be able to assign a single IP Address per switch rendering it useless for this scenario. A quick shortcut when creating Layer 3 VLANs is to enter the next interface name whilst in the config-if mode then press the up arrow twice to edit the subnet line. Whilst not saving huge amounts of time, every little helps as you go through the configs. However, if you have logging enabled this will ruin you rhythm so turn that off first. The verification command is show ip interface brief or show ip int br. I’ve probably stretched that topic about as far as it can go but its a good start! Check out the resources page for resources I’ve used, verification commands and the budding lab task list that I’ll be using to practice closer to the lab.